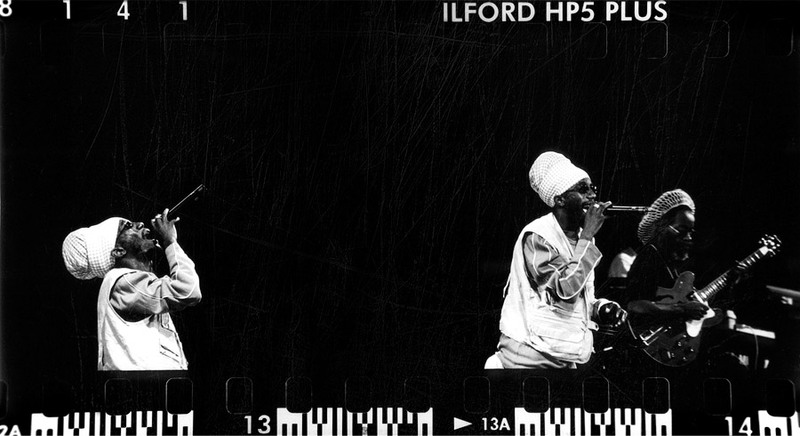 Photo Sizzla Kalonji black and white photo shot by Floyd Celluloyd for Innermann a decade of reggae photography. Please respect the copyright. Do not use the photos without written permission. Sizzla Kalonji, or simply Sizzla, born Miguel Orlando Collins, 17 April 1976 in Saint Mary, Jamaica. He is one of the most commercially and critically successful contemporary reggae artists and is well-known for his unusual productivity. Sizzla was born in St Mary's to devout Rastafari movement parents. Like them Sizzla subscribes to the Bobo Ashanti branch of the Rastafari movement. He was raised in August Town, Kingston Jamaica where he studied mechanical engineering at Dunoon High School. He now resides in Harare, Zimbabwe and in May 2010 he was given a farm in Chegutu, Zimbabwe for his performance at the president Robert Mugabe's birthday bash. The 1980s witnessed a dancehall explosion, and with the music came the lifestyle: drugs, guns, and "slackness" (vulgarity). Formally adopting the Rastafari faith, with its advocacy of repatriation to Africa and its use of cannabis, he joined the ranks of the Bobo Ashanti in the mid-1990s. Sizzla began to develop his own style whilst serving his musical apprenticeship with the Caveman Hi-Fi sound system. He has used his music as a vehicle for his message, kickstarting his recording career in 1995 with a release through the Zagalou label, he then teamed up with "Bobby Digital" Dixon for a series of singles. Extensive touring with fellow roots and culture artist Luciano followed, earning Sizzla notability. Jermaine Fagan, the same man who gave Buju Banton his first break, introduced Sizzla to top Jamaican saxophonist Dean Fraser, the musical director for Philip "Fatis" Burrell's Xterminator Family. 1996 marked an important turning point for Sizzla when he began working with Fatis. This union led to a run of successful singles and the release of Sizzla's debut album, Burning Up. The two allied again a year later with the follow-up, Praise Ye Jah (JetStar). Praise Ye Jah was quickly trumped by his release of the Dixon-produced "Black Woman & Child" that same year. The title track was a smash hit and became something of a cultural reggae anthem. Sizzla scored several more hits during 1997, including "Like Mountain," "Babylon Cowboy," "Kings of the Earth," and the Luciano duet "Build a Better World." This hot streak kicked off an enormously productive recording binge that lasted over the next several years, with much of his output still done for Burrell. Along with universal praise came Sizzla's first nomination for Best International Reggae Artist of the Year at the 1998 MOBO Awards and a place in various magazines' top 100 albums of the year. Sizzla has since released several dozen albums, including 1998's Kalonji and Royal Son of Ethiopia from 1999. 1999 also saw him receive his second MOBO nomination. Sizzla remains a constant presence in the reggae charts worldwide. Currently, Sizzla has 21 albums that have made it onto the Billboard's Top Reggae Albums music chart, the highest Words of Truth, reaching the peak position of #5. Sizzla Kalonji has released over 45 solo albums and over fifteen combination albums, crossing different genres of Reggae. He has started his own record company, Kalonji Records; which in a joint venture with Damon Dash Music Group and Koch Records, released the album, The Overstanding, in November 2006. This was his third album released through Kalonji Records; as well as Black History and Life. Sizzla, along with reggae recording artists such as Capleton, Buju Banton, and Anthony B, are credited with leading a movement toward a re-embracement of Rastafarian values in contemporary reggae music by recording material which is concerned primarily with spirituality and social consciousness, explores common themes, such as Babylon's corrupting influence, the disenfranchisement of ghetto youth, oppression of the black nation and Sizzla's abiding faith in Jah and resistance against perceived agents of oppression. Sizzla's 2008 effort, Ghetto Youth-ology, is produced by the Firehouse Crew, the same who produced Sizzla's debut, Burning Up. Judgement Yard was established as a community centre in August Town, an eastern suburb of Kingston, Jamaica, by Sizzla Kalonji. Although Judgement Yard is an organization of sorts, it is also a geographic location located at 42 August Town Road, which is where Sizzla maintains one of his residences. Judgement Yard is also the home of Kalonji's state of the art studio, as well as his record label, Kalonji Records. As the owner and founder of the Yard, Kalonji is responsible for many youths in the community of August Town, as well as youths who come from other areas to seek assistance and guidance in life as well as music.He is an influence to many. Many of these same youths who are members of Judgement Yard fraternity are musicians or have some direct affiliation with the music through production works, artiste works, etc.